As soon as you arrive to USA, one of the important things you do is applying for Social Security Card. Every student who come to USA on a J-1 status is required to have the SSN. Without it, paychecks won’t be issued; also it is equally important to file for tax returns at the end of the year. Students, who come to Ocean City, MD can apply at Salisbury, MD Social Security Administration Office, located at 2414 Northgate Drive, Salisbury, MD. Office is open Monday through Friday 8:30am till 3:30pm. Salisbury is located 30 miles away from Ocean City, MD. One of the services E-Point offers is assistance registering and applying for SSN. We have low fare ($10 roundtrip) shuttles departing from our center every morning throughout May-June, located at 15th street in Ocean City. Usually it takes 2 or 3 hours to complete the entire process including commuting times. As for those students who are heading to Delaware shores, E-Point offers the same assistance from our Rehoboth Beach location. Delaware students apply at Georgetown location. 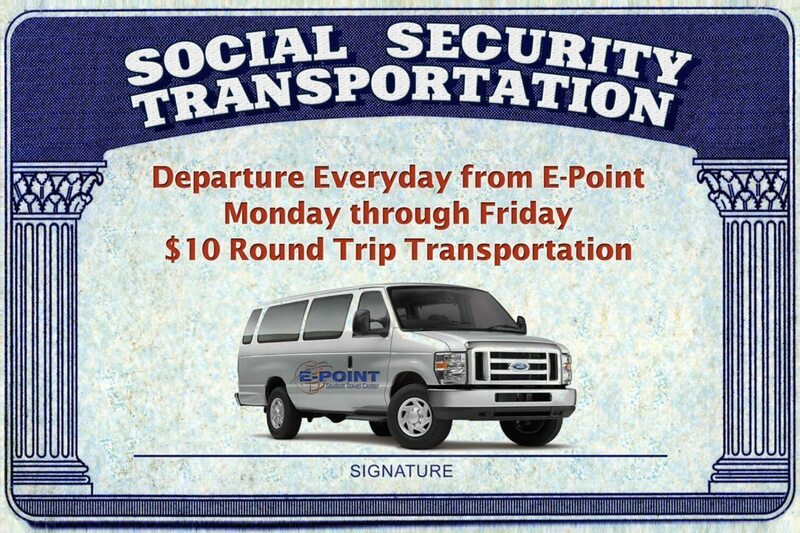 Shuttles from Rehoboth center are running everyday during the weeks of May-June. It takes about 2 – 4 weeks for your card and number to arrive. When you apply for a card, you will be given a letter to show your employer that you have successfully applied for social Security card and it will state the date when your card is ready for pick up. Be aware that some employers will not give you your paycheck until you get your Social Security number. If you are staying in Ocean City, Maryland, all social security applications will take place in Salisbury, MD. Social Security Administration will deliver cards on Wednesdays at 1pm at City Hall located 3rd street and Baltimore ave in Ocean City, MD. Provide your employer with this information to ensure proper taxes are withheld. Maryland State tax is withheld from your pay unless you fill a Form 507. Ask your employer for more information. It is illegal for an employer to withhold your wages because you do not have your SS card yet. You must be paid for the time you work, regardless of whether or not you have been assigned a SS number. Sevis registration is one of the services E-Point offers, so feel free to ask related questions, we will be happy to assist every Work &Travel participant. The Student and Exchange Visitor Information System (SEVIS), administered by the Bureau of Immigration and Customs Enforcement (ICE) within the Department of Homeland Security (DHS), is an Internet-based system that maintains data on foreign students and exchange visitors before and during their stay in the United States. Failure to have participation validated will result in an automatic invalidated SEVIS record. IMPORTANT !!! Government regulations for the Summer Work and Travel Program mandate that students must check-in with their sponsor within 10 days of arrival in the USA. Failure to check-in within 10 days will result in program termination. Termination means student’s status in SEVIS will be inactive, student cannot legally work in USA, will not have medical insurance, and will need to return home immediately; will have difficulty obtaining any type of visa in the future.